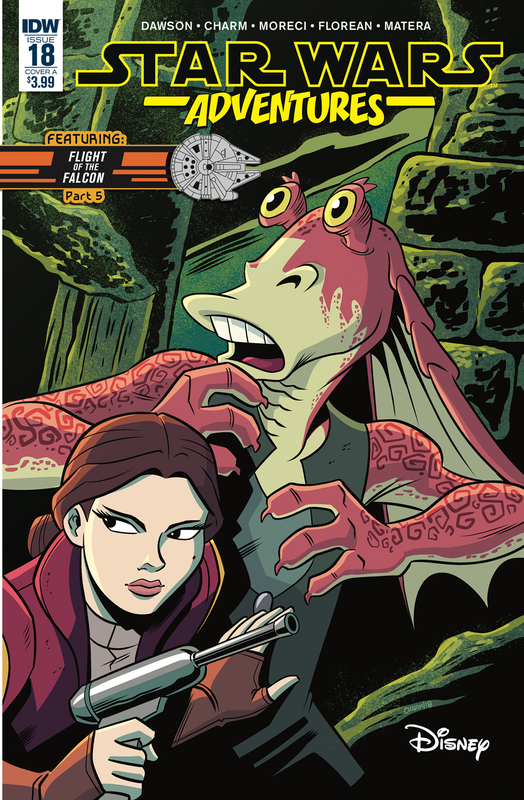 Star Wars Adventures #18 contains two stories, one about Jar Jar and Padme, and the other revealing the story of Ducain, they person who stole the Millennium Falcon from Han Solo. Both are humorous and lighthearted, since they are kid stories, and each story has a different art team. Overall, not too bad of an issue. “Raiders of the Lost Gundark” is written by Delilah S. Dawson and centers around an old map Jar Jar found. He enlists Padme’s help in finding an old Gungan treasure, but along the way they have to tackles some obstacles. As the name hints, that includes a gundark. In the end, the jokes on Jar Jar, and there’s lots of fun along the way. Derek Charm handles the artwork for this story, and his artwork is a bit more stylistic. Not my personal preference, but it does a good job of bringing the scenes to life with bright colors and cartoony characters. “Grand Theft Falcon” is part five of the Flight of the Falcon series and links up with the book Pirate’s Price featuring Hondo. There’s no Hondo in this story, instead it centers on Ducain, the guy Han mentions in The Force Awakens. Ducain, however, is probably not what you imagined. In this story, we learn who he is, how he wound up stealing the Falcon, and why. We also learn what happened to Ducain. Unfortunately for Bazine, Ducain doesn’t have the Falcon anymore, so she’s off on her way to track down more clues. That’s going to lead to one more story (beyond Pirate’s Price) to conclude the series. As is, I liked the artwork (done by Arianna Florean and Adele Matera) and the story was fun. I’m glad we finally got to learn who Ducain was. Overall, I give this issue a four out of five baby nexus. It’s not a must have, but it’s enjoyable and worth checking out.